The Icon of the Blessed Virgin Mary with the Christ Child that hangs it is venerated for The Latin-American Anglican Church [Catholic Church Anglican Tradition], is that of the famous English depiction of the Blessed Virgin Mary ( Saint Mary of Walsingham - Santa Maria de Walsingham) who appeared to the Lady of the Manor near the little Village of Walsingham in England in 1061 AD, during the time of Saint Edward the Confessor. Both our Lord Jesus, and His Blessed Mother are depicted as Anglo-Saxon. The Virgin is seated on a high backed throne, wearing a low medieval crown, with the fleur-de-lis staff in her right hand, presenting Jesus to all who will receive Him, holding the Christ Child in her left hand. The Christ Child is clasping the Book of the Gospels in His left hand, and his right hand is raised in blessing. The Blessed Virgin Mary is honored for her part in God’s timeless plan for the redemption of the world by our Lord Jesus Christ. We honor her for her response and commitment to God, and for the part that she played in procuring our salvation. She was honored by God above all creation, in that the Blessed Virgin Mary bore in her own body, the Eternal Word of God. During the reign of Saint Edward the Confessor in 1061, the Blessed Virgin Mary appeared to a devout widow, Richeldis de Faverches, Lady of the Manor of Walsingham, in a remote village of Norfolk, England. Sacred Tradition tells us that our Lady appeared to Richeldis in the fields outside of Walsingham, and showed her a model of the Holy House in which she had lived as a child where the Archangel Gabriel announced God’s will that she should become the Mother of our Lord, and where after the return from Egypt the Holy Family had dwelt. The Blessed Virgin Mary requested that Richeldis build a replica of the little house of Nazareth there in England, in honor of the mystery of the Incarnation. All through the Middle Ages, our Lady was honored in her Shrine at Walsingham. Augustinian Canons coming to look after the Shrine and minister to the pilgrims, built a Priory. A Franciscan House was also founded. The ruins of both can be seen today. For four hundred and seventy-seven years our Lady’s Shrine was loved and honored. The pilgrims were Kings and Queens, nobles, and serfs, rich and poor, all coming to honor our Lord Jesus Christ through the commitment a young girl made to God long ago. All continued to come in endless procession to pray and to drink of the waters of the Holy Well. God had set His mark on Walsingham. Prayers were heard, and miracles happened. The Shrine of Our Lady of Walsingham was a faithful witness to the world of the catholic faith and doctrine of the Incarnation -- God become man in Jesus Christ -- found within the English Church. Then evil days fell on England. A self-willed King made war against God, our Lady and all the Saints, and decreed desecration of holy places. At his command, the Holy House was torn down, the Holy Well was clogged, and the famous likeness of the Virgin Mary under the title of Our Lady of Walsingham, was carried off to London and publicly burned. There was much in the church at that period in need of reform, but Henry VIII, who had himself once been numbered among the pilgrims at the Shrine and at one time with his own hand placed a precious necklace around the neck of our Lady’s statue, made this an excuse to plunder monasteries and seize their treasurers and revenue. Walsingham suffered with the rest, and because the Shrine was in the charge of the Canons, the Priory too, was despoiled. It is said that Henry VIII, in his last hour, commended his soul to Our Lady of Walsingham. But the evil was done, and the Shrine was destroyed. Silence and desolation settled over “England’s Nazareth,” and Walsingham almost became a forgotten village. These actions burnt deep into the hearts and the minds of the people, but deep down, the memory of Mary’s Shrine was not totally forgotten. After the long silence of almost four centuries, the streets of the little Village began to echo again to the steps of pilgrims. 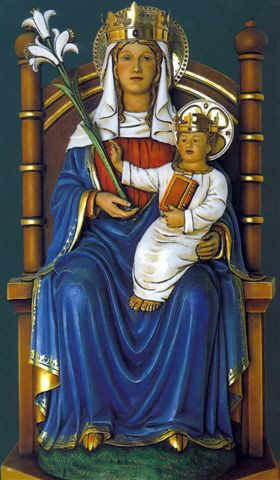 In 1921 the present depiction of Our Lady of Walsingham was carved in the likeness of the figure shown on the old twelfth-century Priory Seal, and placed in the Parish Church. Ten years later, this figure of Our Lady of Walsingham was enshrined triumphantly in a new chapel made after the fashion, and according to the measurements of the Holy House erected by Lady Richeldis. The Shrine of Our Lady of Walsingham has become the focus of the revived pilgrimage, and a great center of intercession for the sick and needy. In 1931 when the ground was being prepared for the foundations for the new building, the footings of the original eleventh century chapel were disclosed: a blocked up well was also discovered. It was packed with clay, but when this was removed, clear water gushed out. At the bottom of the well were found the leather soles of a number of shoes of all sizes, of early sixteenth century date, evidently thrown there as an expression of contempt. Although the site of the original Holy House had long been unknown, this well is believed to be the well of our Lady built to contain the water of the spring which appeared in 1061. Thus the Holy Well, along with the Holy House, is enclosed in the Pilgrim Church of today, and is now visited by countless pilgrims whose prayers have been answered, and where miracles have been attested. Again, pilgrims come to Walsingham in their thousands to bear witness to their faith in the Incarnation, and like pilgrims of old, to seek temporal and spiritual blessings. What the Blessed Virgin Mary requested in Saxon days is once more established to the greater glory of God.. The privilege of restoring the ancient Shrine of Our Lady of Walsingham has been reserved for catholics of the Church of England, but Anglicans ( Episcopalians ) are not alone in honoring our Lady. The Orthodox have a chapel attached to the Pilgrim Church where services are held regularly. Catholics of the Roman Communion use the ancient “Slipper Chapel” as their shrine, which is a mile or so from Walsingham on the London Road. It is called the “Slipper Chapel” because it was customary when pilgrims reached this wayside chapel, to take off their shoes and make the rest of the journey barefoot. Happily, the mystery of the Incarnation is once again honored and reverenced in Walsingham as in days of old, and even though the sad divisions of Christianity are still with us, it is a matter for thanksgiving that East and West, the Orthodox, Anglican ( Episcopal ), and Roman Communions of The Catholic Church may meet together in their common devotion to the Mother of Jesus Christ, our Lord, our Saviour, and our God. SAINT MARY OF WALSINGHAM Father in heaven, by your grace the virgin mother of your incarnate Son was blessed in bearing him, but still more blessed in keeping your word: Grant us who honor the exaltation of her lowliness to follow the example of her devotion to your will; through Jesus Christ our Lord, who lives and reigns with you and the Holy Spirit, one God, for ever and ever. Amen. Almighty and everlasting God, who willed that your Word should take flesh in the womb of the Blessed Virgin Mary by the power of your over-shadowing Spirit, by her affectionate intercession deliver us from all present sin and sorrow, and conduct us to the everlasting joys of our heavenly home; through Jesus Christ our Lord. Amen.